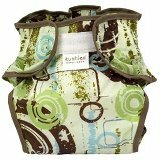 Fleece diaper covers offer a lot of benefits and can be a great option for cloth diapering your baby. 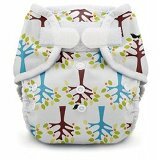 Fleece diaper covers can be a particularly good choice for babies who are prone to diaper rash as it is gentle on the skin. It will wick moisture away from your baby, it is incredibly thin and soft, which allows for a trim fit and feels great against baby's skin, and it is breathable, which keeps your baby cool. Fleece diapers dry quite quickly, and they are simple to clean and care for (which is why some people prefer fleece over wool diaper covers which need to be hand washed). Fleece on its own is not waterproof, so fleece diapers can feel damp if a wet diaper has not been changed in a while. 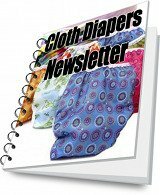 To address this issue, some fleece covers have a laminate layer on the outside which prevents wetness from wicking to the outside of the diaper. Fleece is also not absorbent on its own; it must be used in combination with an absorbent layer. Fleece is typically used as a diaper cover, and sometimes it is used in diaper liners in combination with a layer of absorbent fabric. It may also be used in all in ones and pocket diapers as the layer that touches your baby's skin in order to provide softness and wick away moisture. Approximately $25 per diaper. Prices vary depending upon the style and features.